Fusarium oxysporum f. sp. cúbense (Foc) is a fungus that infects banana roots and causes a destructive plant disease called Fusarium wilt. Foc consists of three pathogenic races (Foc races 1, 2 and 4), classified according to their selective impairment of banana cultivars. Foc race 4 is economically important as it comprises strains that infect Cavendish bananas, which are the most widely planted variety of bananas in the world, in both the tropics (Foc TR4) and subtropics (Foc STR4). The aim of this study was to investigate which genes are potentially involved in fungal pathogenicity by comparing transcript-derived cDNA fragments (TDFs) from Foc STR4 and TR4 to those from non-pathogenic F. oxysporum using cDNA-AFLP analysis. This comparison resulted in the identification of 229 unique gene fragments which include the putative pathogenicity-related TDFs encoding chitinase class V (chsV), GTPase activating protein, Major Facilitator Superfamily (MFS) multidrug transporter and serine/threonine protein kinase (ste12) genes. Quantitative analysis of transcript abundance showed a significant increase in expression of chsV, MFS multidrug transporter and ste12 genes in Foc STR4 and TR4 compared with the non-pathogenic F. oxysporum. These genes play a role in escaping host defence responses and in cell wall degradation. In addition, pathogenicity-related genes from other formae speciales of F. oxysporum, such as the sucrose non-fermenting, cytochrome P450 and F-box protein required for pathogenicity genes, were significantly up-regulated in Foc STR4 and TR4 but not in F. oxysporum isolates non-pathogenic to banana. This study provides the first in vitro comparative analysis of TDFs expressed in pathogenic Foc race 4 isolates and non-pathogenic F. oxysporum isolates from banana. A total of 27 F. oxysporum isolates were selected for this study. 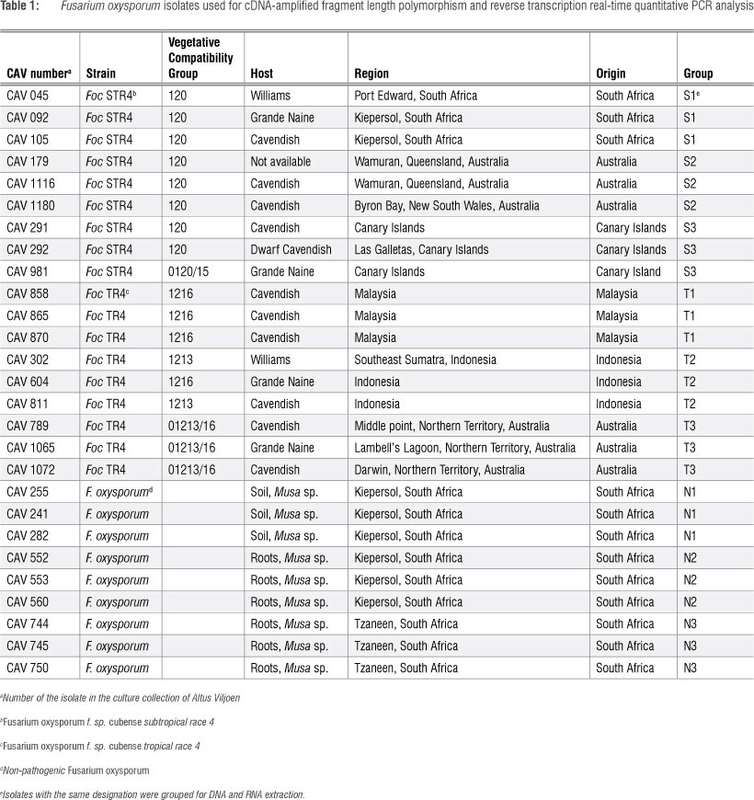 These isolates included Foc STR4 from South Africa, Australia and the Canary Islands, Foc TR4 from Malaysia, Indonesia and Northern Australia, and non-pathogenic F. oxysporum obtained from Cavendish banana roots in South Africa (Table 1). The non-pathogenic F. oxysporum isolates were shown to be non-pathogenic as no internal disease symptoms developed after inoculating banana roots with a spore suspension (1x105 spores/mL) in a hydroponic system.25,27,32,33 All isolates were maintained in 15% glycerol at -80 °C at the Department of Plant Pathology, Stellenbosch University. RNA was extracted from fungal mycelia grown in vitro rather than in planta, as insufficient genes of fungal origin were previously detected in the roots of tissue-cultured banana plants 14 d after inoculation with Foc race 4 (1x105 spore/mL). The F. oxysporum isolates were first grown on half strength potato dextrose agar (PDA) (19.5 g/L PDA and 10 g/L agar) for 5 days at ±25 °C, and then transferred to liquid minimal medium (MM) without a carbon source to enhance the transcript abundance of pathogenicity genes.34OhZd After culturing the isolates in MM on a rotary shaker set at 90 rpm for 5 days at 25 °C, the medium was filtered through sterile cheesecloth. The mycelial mass was scraped and frozen in liquid nitrogen, ground to a fine powder with a basic analytical mill (IKA A111, United Scientific (Pty) Ltd., San Diego, CA, USA), and stored at -80 °C until RNA was extracted. Transcript expression levels of putative pathogenicity genes in F. oxysporum were assessed by cDNA-AFLP analysis. The AFLP® Expression Analysis Kit (LICOR, Lincoln, NE, USA) was employed according to the manufacturer's instructions to determine differential gene expression patterns. Briefly, cDNA was digested with the restriction enzymes TaqI and Msel, followed by ligating adapters using T4 DNA ligase. 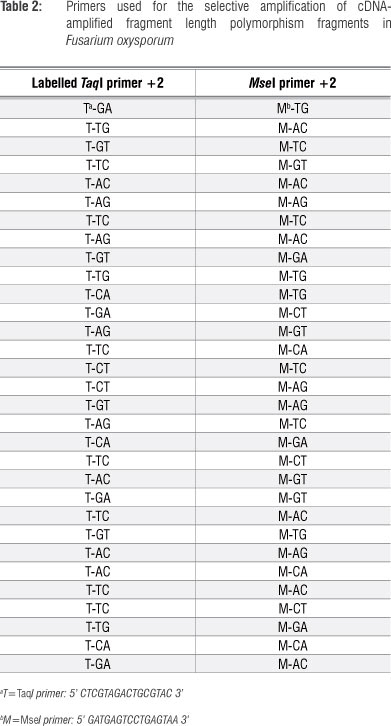 Pre-selective amplification was performed with TaqI+0/MseI+0 primers, and 31 different TaqI + 2/MseI+2 primer combinations were used during selective amplification (Table 2). Band intensities of differentially expressed fragments on cDNA-AFLP gels were visually assessed and divided into four groups: (1) no transcripts detected (-), (2) low level of transcript abundance (+), (3) moderate level of transcript abundance (++) and (4) high level of transcript abundance (+++). Band intensities correspond to the original expression level. After polyacrylamide gels were resolved on the LICOR analyser and scanned with the Odyssey® infrared imaging system (LICOR), unique bands were identified using Quantity One 1-D analysis software (Bio-Rad Laboratories Inc., Hercules, CA, USA). Bands were excised and cloned into a vector with the InsTAclone™ PCR cloning kit (Fermentas) and sequenced in both directions. Vector sequences were manually removed from the raw sequences by Chromas 1.45 (www.technelysium.com.au/chromas.html), while BioEdit Sequence Alignment Editor 7.0.5.3 software36 was used to create a consensus sequence for each individual fragment. The consensus sequences were compared with Fusarium genome sequences of the Broad Institute (http://www.broad.mit.edu/annotation/genome/fusarium_group/Blast.html) and on the National Center for Biotechnology Information (NCBI) database (http://blast.ncbi.nlm.nih.gov/Blast.cgi) for identification. 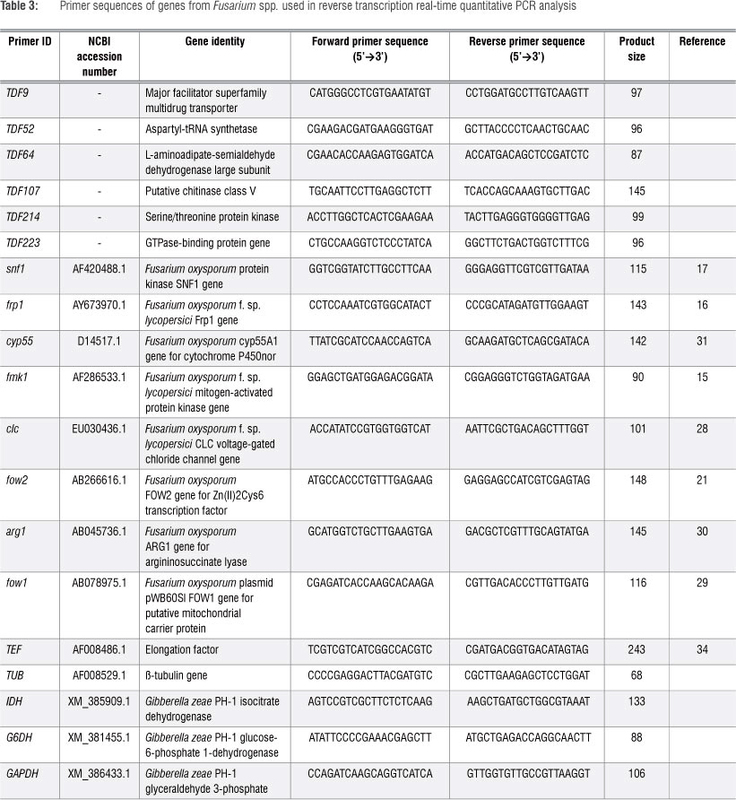 The transcript-derived fragments (TDFs) obtained with cDNA-AFLPs were further characterised using Desktop cDNA Annotation System (dCAS, NIAID, Bethesda, MD, USA).37 Functional groups were defined according to the Munich Information Center for Protein Sequences (MIPS)38 and Gene Ontology (GO)39 databases. 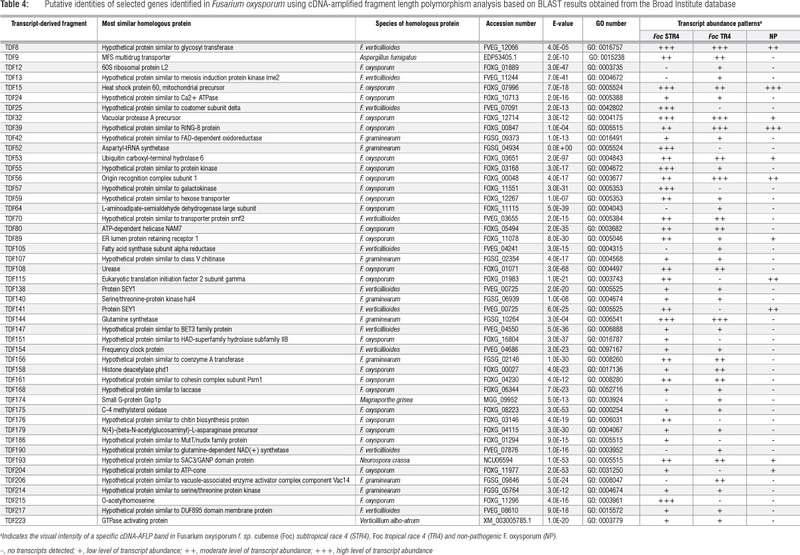 The transcript abundance of six putative pathogenicity genes identified by cDNA-AFLP in the current study, and eight known pathogenicity genes of F. oxysporum (Table 3), was assessed using a LightCycler 480 instrument (Roche Diagnostics). Five reference genes - elongation factor 1α (TEF), β-tubulin (TUB), isocitrate dehydrogenase (IDH), glucoses-phosphate 1-dehydrogenase (G6DH) and glyceraldehyde 3-phosphate (GAPDH) - were also evaluated (Table 3). Primers for the putative and known pathogenicity and reference genes were designed using Primer3 (Whitehead Institute, MIT, Cambridge, MA, USA) and Netprimer (Premier Biosoft, Palo Alto, CA, USA) (Table 3) and synthesised by Operon Biotechnologies GmbH (Cologne, Germany). RT-qPCR reactions were performed in 10-uL volumes containing cDNA template (1:10 dilution), 1 of each of the forward and reverse primers and 5 DNA MasterPLUS SYBR Green mix (Roche Diagnostic). The protocol included 10 min at 95 °C followed by 55 cycles of 10 s at 95 °C, 10 s at 57 °C and 10 s at 72 °C. The amplification process was completed by a melting cycle from 55 °C to 95 °C to assess specificity. The fluorescence reading was recorded at 72 °C at the end of the elongation cycles. The PCR products were analysed by electrophoresis on a 2% agarose gel to verify that a single product of the expected size was produced. All reactions were performed in triplicate with three independent biological replicates and a negative control (no template) for all genes. A standard curve was generated by preparing a dilution series (1:10, 1:100 and 1:1000) for each pathogenicity and reference gene. Gene expression stability (M-value) and pairwise variation (V-values) were determined using Genorm.40 Ct values were imported into qbasePLUS (Biogazelle, Ghent, Belgium) for further analysis. The difference in Ct values was determined statistically by one-way analysis of variance, followed by Tukey's post-hoc analysis; p<0.05 was considered statistically significant. cDNA expression patterns of approximately 3150 transcripts were examined with 31 different TaqI+2/MseI+2 primer combinations. For each primer combination, 63-138 TDFs were visualised and varied from 100 bp to 700 bp with approximately 8% of the TDF showing differential expression. cDNA-AFLP analysis allowed the identification and isolation of 229 differentially expressed TDFs of between 103 bp and 546 bp in size (Table 4). The TDFs were classified into these functional categories: hypothetical proteins from Fusarium (90) and other fungal species (6), energy metabolism (13), transport (13), cell division and growth (11), protein turnover (8), cell signalling (9),- lipid or fatty acid metabolism (5), transcription and translation factors (6), and those with no significant homology (68) (Figure 1). BLAST analysis with an rRNA operon showed that only one TDF (0.4%) had homology to rRNA. Several TDFs represent genes with numerous functions, including pathogenicity. These TDFs included the putative chitinase class V (chsV) (TDF107), GTPase activating protein (rhoI) (TDF223), Major Facilitator Superfamily (MFS) multidrug transporter (TDF9), laccase (lcc) (TDF168), Ca2+ ATPase (TDF24) and serine/ threonine protein kinase (ste12) (TDF214) genes (Table 4). The TDFs corresponding to chsV, rhoI, lcc, Ca2+ ATPase, and ste12 showed low intensity levels in Foc STR4 and Foc TR4 compared with non-pathogenic F. oxysporum where transcripts were not visually detected. The TDF representing the MFS multidrug transporter gene displayed moderate intensity in Foc STR4 and Foc TR4 compared with undetectable levels in non-pathogenic F. oxysporum (Figure 2a). Several different transcript abundance patterns were detected during cDNA-AFLP gel analysis (Table 4). In the first pattern, high transcript abundance was detected in Foc STR4 with no transcripts detected in Foc TR4 or non-pathogenic F. oxysporum. Examples showing high abundance include TDFs corresponding to the aspartyl-tRNA synthetase (TDF52), galactokinase (TDF57) and O-acetylhomoserine (TDF215). The second transcript abundance pattern showed an increase in transcripts in Foc TR4 with no transcripts detected in Foc STR4 or non-pathogenic F. oxysporum. TDFs that exhibited this pattern were 60S ribosomal protein L2 (TDF12), meiosis induction protein (TDF13), L-aminoadipate semialdehyde dehydrogenase large subunit (TDF64), fatty acid synthase subunit alpha reductase (TDF105), small G-protein Gsp1p (TDF174) and glutamine-dependent NAD+ synthetase (TDF190). In the third pattern, transcripts were detected in Foc STR4 and Foc TR4 with no detection in non-pathogenic F. oxysporum. Examples of these transcripts include-chsV (TDF107), Ca2+ ATPase (TDF24), FAD-dependent oxidoreductase (TDF42), ste12 (TDF214), GTPase activating protein (TDF223) and lcc (TDF168). Other transcript abundance patterns included transcript presence in Foc STR4 and the non-pathogenic strains, with no transcripts detected in Foc TR4. These transcripts included eukaryotic translation initiation factor 2 subunit gamma (TDF115) and ATP-cone (TDF204). Another pattern displayed low levels of transcript abundance in Foc STR4 with high transcript abundance in Foc TR4 and non-pathogenic F. oxysporum. The relative transcript abundance of six genes measured by cDNA-AFLP analysis - encoding a MFS multidrug transporter (TDF9), a L-aminoadipate-semialdehyde dehydrogenase large subunit (TDF64), an aspartyl-tRNA synthetase (TDF52), a chsV (TDF107), a ste12 (TDF214) and rhoI (TDF223) - was compared with results obtained by qRT-PCR (Figure 2). Both cDNA-AFLP and qRT-PCR analyses showed an increased abundance of the MFS multidrug transporter gene in Foc STR4 and Foc TR4 when compared with non-pathogenic F. oxysporum (Figure 2a). When the abundance levels of L-aminoadipate-semialdehyde dehydrogenase large subunit were compared, the cDNA-AFLP analysis demonstrated that the transcript was present in Foc TR4 but absent in the transcript in Foc STR4 and the non-pathogenic F. oxysporum. The qRT-PCR data showed similar levels of transcript abundance in Foc TR4, Foc STR4 and the non-pathogenic F. oxysporum (Figure 2b). cDNA-AFLP analyses showed an increased abundance of transcripts of aspartyl-tRNA synthetase in Foc STR4 compared with Foc TR4 and the non-pathogenic F. oxysporum, while qRT-PCR revealed similar transcript levels among the different isolates (Figure 2c). An increase in transcript abundance of chsV was found in Foc STR4 and Foc TR4 when compared with the non-pathogenic F. oxysporum using both cDNA-AFLP analysis and qRT-PCR (Figure 2d). Transcript abundance profiles determined for ste12 by cDNA-AFLP and qRT-PCR were similar, and showed an increase in Foc STR4 and Foc TR4 compared with the non-pathogenic F. oxysporum (Figure 2e). In the case of rhoI, cDNA-AFLP analysis showed an increase in the number of transcripts in Foc race 4 compared with the non-pathogenic F. oxysporum (Figure 2f). However, qRT-PCR showed a higher number of transcripts in Foc STR4 than in Foc TR4 and the non-pathogenic F. oxysporum. Thus, the transcript abundance patterns measured by qRT-PCR were similar to those measured for the corresponding TDFs analysed using cDNA-AFLP. Foc STR4 and Foc TR4 expressed the pathogenicity genes snf (Figure 3a), frp1 (Figure 3b) and cyp55 (Figure 3c) at significantly higher levels than non-pathogenic F. oxysporum. The transcript abundance of snf was 2.6-fold higher in Foc STR4 than in the non-pathogenic F. oxysporum. The transcript abundance levels of frp1 were lower in non-pathogenic F. oxysporum isolates than in pathogenic Foc STR4 and Foc TR4 isolates, by 3.6-fold and 2.5-fold, respectively. Snf and frp1 are involved in the degradation of plant cell walls.17,41Cyp55 had a 1.6-fold higher expression in Foc TR4 compared with Foc STR4, but this difference was not statistically significant. Cyp55 is a nitric oxide reductase involved in the nitrogen response pathway, which is fundamental for pathogenicity. Fmk1 is responsible for maintaining fungal cell wall architecture and signalling. Fmk1 was expressed significantly more in Foc STR4 than in either Foc TR4 or non-pathogenic F. oxysporum (Figure 3d). Fmk1 expression was 2.9-fold higher in Foc STR4 than in the non-pathogenic-F. oxysporum (Figure 3d). In addition, transcript abundance of fmk1 was a significant 2.1-fold higher in Foc STR4 than in Foc TR4. Expression of the chloride channel (clc) gene, which controls laccase activity, was also significantly higher in Foc STR4 than in the non-pathogenic F. oxysporum (Figure 3e). In contrast, fow2, the fungal gene involved in regulating pathogenicity-related transcription, was expressed significantly more in Foc TR4 than in the non-pathogenic F. oxysporum, but not significantly more than in Foc STR4 (Figure 3f). 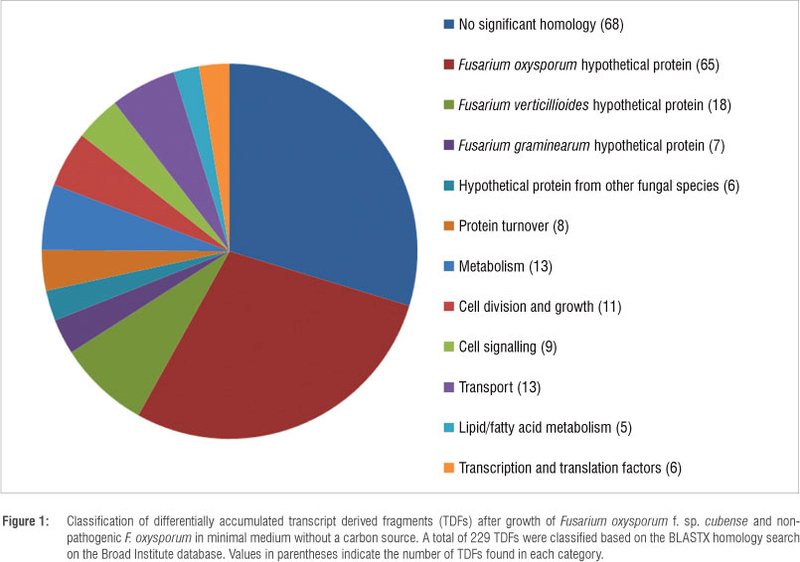 There were no significant differences observed in the transcript abundance profiles of the arginine biosynthesis gene (arg1) (Figure 3g) or mitochondrial protein gene (fow1) (Figure 3h). The transcriptomes of Foc STR4, Foc TR4 and non-pathogenic F. oxysporum isolates on MM (without carbon source) were visually detected with cDNA-AFLP More than 3000 TDFs were detected, of which 8% showed differential expression patterns. A total of 3% of these TDFs were putatively involved in pathogenicity. Several fungal gene transcripts that have previously been associated with pathogenicity in other fungal organisms have been identified for the first time in the banana pathogen Foc. These genes include chsV, rhoI, MFS multidrug transporter and stel2. In addition, the genes snf, frp1 and cyp55, which result in diseases of crops other than banana, were more abundantly expressed in Foc STR4 and Foc TR4 than in non-pathogenic F. oxysporum. The genes chsV and rhoI have previously been associated with pathogenicity in Fol on tomato.42,43ChsV restricts toxic substances- produced by the plant for defence against pathogens,42 whereas rho1 plays a role in preventing the host plant from recognising the pathogen.43 Both genes, therefore, protect the pathogen against the host's defence response. Because chsV and rho1 showed higher transcript abundances in Foc STR4 and Foc TR4 than in the non-pathogen, we hypothesise that Foc expresses these genes when infecting the xylem vessels of Cavendish bananas to avoid the plant's defence responses. The transcript abundance of the MFS multidrug transporter was fivefold higher in pathogenic Foc than in the non-pathogen. This family of transporters regulate the movement of sugars, Krebs-cycle metabolites, phosphorylated glycolytic intermediates, amino acids, peptides, osmolites, iron-siderophores, nucleosides and organic and inorganic anions and cations.44 In addition, MFS transporters have been linked to fungal pathogenicity by avoiding toxic compounds produced by the pathogen, or by protection against plant defence compounds.45 MFS transpor ter gene in the ascomycete Verticillium dahlia - a vascular pathogen - is essential for pathogenicity on lettuce plants.46 With a significantly higher transcript abundance of the MFS multidrug transporter, Foc STR4 and Foc TR4 may possibly protect themselves from toxic substances produced by the plant during defence. The transcription factor ste12 is important during fungal infection of plant roots where it regulates genes involved in the MAPK cascade.20,47 In a study by Garcia-Sanchez et al.22, a ste12-like gene, fost12, showed an increased expression after 12-24 h of infection of bean plants by F.-oxysporum f. sp. phaseoli. A significant increase in transcript abundance of ste12 in Foc STR4 and Foc TR4 can activate the MAPK signalling pathways, thereby increasing CWDE during the infection process. A second transcription factor, fow2,21 a Zn(II)2Cys6-type transcription regulator involved in pathogenicity in F. oxysporum f. sp. melonis, was significantly higher in Foc TR4 than in the non-pathogen, but there was no significant difference between Foc STR4 and the non-pathogen. Because Foc TR4 is a more virulent pathogen than Foc STR4, fow2 may assist in the more rapid invasion of root tissue or may be differentially regulated in Foc STR4 and Foc TR4. Two well-studied pathogenicity genes previously isolated from F. oxysporum that regulate the abundance of CWDEs are snf and frp1.16,17,41 Both snf and frp1 were significantly higher in Foc STR4 and Foc TR4 than in the non-pathogen, which suggests that these genes are important for the Fusarium wilt pathogen to enter the host xylem tissue. As an endophyte, the non-pathogenic F. oxysporum isolates are usually restricted to the root cortex, and do not enter the xylem vessels.48 In contrast, Foc STR4 and Foc TR4 both degrade the xylem cell walls to enter the vascular tissue. Pathogenicity and cell wall degradation are affected by the enhanced expression of MAP kinases in several fungi, for example Fol,15 Fusarium graminearum,49 Magnaporthe grisea50 and Ustilago maydis51. In Fol, fmk1 also aids in root attachment, penetration, invasive growth and increased CWDE activity.15 The significant increase in fmk1 in Foc STR4 and non-significant increase in Foc TR4 compared with non-pathogenic F. oxysporum may explain pathogenesis in the banana Fusarium wilt pathogen, that is by accelerating invasive growth as in other Fusarium species.15,52 Pathogenic Foc isolates are able to colonise both the cortex and the xylem tissue, resulting in severe discoloration of the corm and blocking of the vascular bundles. In contrast, the non-pathogenic strains are restricted to the root cortex, which results in no symptoms developing. The reason that fmk1 did not show a significant increase in transcript abundance in Foc TR4 is not certain, but one possible explanation could be that fmk1 transcripts amplified during pathogenicity- at earlier time points were not sampled in this study. Genes expressed during the early time points are either translated into proteins or the RNA is degraded as the half-life of RNA is short and therefore the RNA cannot be detected at later time points. Laccases serve as virulence factors in fungal pathogens by playing a role in pigmentation, appressorium formation and protection against toxic phytoalexins.56 qRT-PCR analysis in this study revealed a significant increase in clc transcripts in Foc STR4 compared with the non-pathogen. In Fol, mutations of lcc1, lcc3 and lcc5 had no effect on pathogenicity in tomato plants.57 As six lcc genes have been identified in F. oxysporum, Cañero and Roncero28 suggested that a mutation in one of them may not necessarily prevent laccase activity, as the other isozymes fulfil their role.57 However, clc mutants showed a decrease in laccase activity with a reduction in virulence to tomato seedlings.28 Increased clc expression and the role of laccases and chloride transport in the banana Fusarium wilt pathogen may be important pathogenicity determinants. DNA and RNA sequencing could provide significantly better results for identifying pathogenicity genes in Foc, both in STR4 and TR4, especially once the full genome sequence of the Fusarium wilt fungus becomes available. Comparison of the Foc genome with that of other forma speciales of F. oxysporum will elucidate the ability of Foc to infect banana roots. Virulence factors can be studied when the genomes of Foc TR4, a more virulent pathogen, are compared with Foc STR4. Furthermore, the function of putative pathogenicity genes during infection should be investigated by gene knockout studies and RNAi silencing. Knockout mutants would help to identify additional genes required for pathogenicity in Foc race 4. An in-depth understanding of pathogenicity in Foc is required if novel approaches to disease management are to be developed. We have identified several transcripts in Foc race 4 that are more abundant in the pathogenic strains compared with the non-pathogens. Many of these TDFs have been shown to play a role in host infection and colonisation by other Fusarium spp. These TDFs encode for CWDEs and proteins involved in avoiding toxic substances produced during plant defence. To establish function, knockout mutants of genes underlying these transcripts need to be generated, and the role of genes such as chsV, rhoI, MFS multidrug transporter, ste12, snf, frp1, cyp55 and fmk1 needs further investigation. With the rapid advancement in molecular techniques in recent years, new strategies for increasing plant resistance against specific Fusarium wilt pathogens can be generated by exploiting the molecular and cellular bases of pathogenicity. This research was funded by The Human Resources for Industry Programme (THRIP), an initiative of the Department of Trade and Industry (DTI); the National Research Foundation Thuthuka programme; and the Banana Growers Association of South Africa. R.S. performed the experiments; A.V., A.A.M., N.v.d.B. and R.S. were involved in the experimental design and data analysis; and all authors contributed in writing the manuscript. 18. Jain S, Akiyama K, Kan T, Ohguchi T, Takata R. The G protein β subunit FGB1 regulates development and pathogenicity in Fusarium oxysporum. Curr Genet.. 2003;43(2):79-86. 36. Hall TA. BioEdit: A user-friendly biological sequence alignment editor and analysis program for Windows 95/98/NT. Nucl Acid S. 1999;41:95-98. 40. Vandesompele J, De Preter K, Pattyn F, Poppe B, Van Roy N, De Paepe A, et al. Accurate normalization of real-time quantitative RT-PCR data by geometric averaging of multiple internal control genes. Genome Biol. 2002;3:research0034. 54. Kizawa H, Tomura D, Oda M, Fukamizu A, Hoshino T, Gotoh O, et al. Nucleotide sequence of the unique nitrate/nitrite-inducible cytochrome P-450 cDNA from Fusarium oxysporum. J Biol Chem. 1991;266(16):10632-10637.